Great food and good company are bound to bring plenty of good vibes for the year to come…So, gather around your family – or friends if you’d rather, we won’t tell 😉 – , pick your favorite 饺子 (jiǎozi, dumpling) recipe and prepare for a serious dumpling party making session! To help you get ready for the 饺子 (jiǎozi) dumpling party of the year, here are a few recipes and tips on making the best Chinese dumplings around! If you’re a hands-on kind of person, odds are you’ll want to get your hands in there and make the wrappings yourself. It’s a pretty straightforward recipe and as far as I’m concerned, nothing beats homemade cooking! It also requires very few ingredients; two in fact, that you most likely already have at home, namely water and all-purpose flour. Even the salt is optional. Sure, the kneading can be quite a workout but it’s definitely worth the effort! You’ll need: 2 cups of flour and 3/4 cups of water. Instructions on what to do next can be found here. Once your dough is ready, you need to tear it into little balls of doughs (1 ball = one dumpling) and them roll the balls out into small flat circles. Here’s how it’s done: You can also check out how to roll out the dough in a superfast mode here. 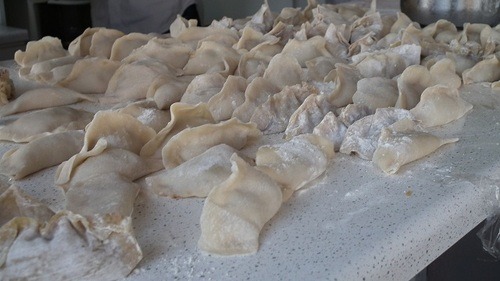 If you’re feeling lazy, unsure of your cooking skills or just ran out of jiaozi dough and can’t face the idea of making some more (it might look like you made a zillion, but they’ll go in the blink of an eye! ), wonton wrappers are a good substitute :). Read here and here on how to choose the best kind of Wonton wrappers at your local Asian store. They might also be called “gyoza” wrappers (Japanese name), or “potstickers”. Or nothing at all in English. As long as they look like a pile of wrappers, and have a picture of dumplings on them, they should work. 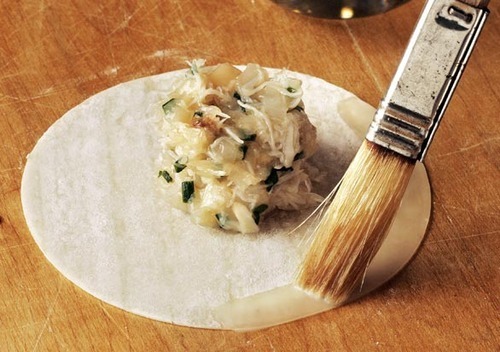 Tip: Wonton wrappers are typically stiffer than homemade dough (and sometimes square, which requires a bit more pliage than round portions do) so you might want to wet them a bit when handling them (to ensure they don’t crack) and/or brush (with a paintbrush – fingers work too!) water on the edges to make sure they stick together better. Now, when it comes to dumpling fillings, you can basically use whatever you want, following the one-meat/ choice of the chopped vegetable rule of thumb. Not very useful I know. Traditional combinations are pork mixed with cabbage, leeks, Chinese chives (called 韭菜 – jiǔcài – way more fragrant than their Western counterpart!) or carrots. Chicken, mutton or beef can be substituted for the pork, of course. Shrimp is also a very popular 馅 (filling) ingredient. Once you’ve decided on your meat and veg(s) of choice, you can pretty much play it by ear, focusing on fragrance and taste, adding a little ginger here, a little Sichuan pepper there, a dash of five-spice, salt and pepper, a splash of sesame oil and cooking wine, chopped scallions; chives … and there! Your filling is ready! You can also choose to follow a recipe that seems good to you. These two sounded 好吃 (hǎochī, good): a pork one and a vegetable and almost no meat one. If you’re not a meat eater at all, this vegetarian recipe seems really simple (not too many ingredients) and tasty. Then there’s this shrimp and chive recipe. I’m also considering this one, which calls for split peas and is a bit more unconventional but still has the potential to be awesome. What you want to watch out the most for is overstuffing. Overfilling the dumplings will unavoidably lead to leakage as you’ll most likely be plunging them in water to cook’em the traditional way during the Chinese New Year. There are of course other ways to cook 饺子 (jiǎozi) but dumplings cooked in water are what you’re supposed to be eating on 除夕chúxī, New Year’s Eve…. So make sure your dumplings are well sealed to prevent leakage and water-filled dumplings! Also, the filling should be moist but not too wet, so it can’t even pretend to try to seep through the wrapper. Remember: a holey dumpling = an empty dumpling wrapper once cooked. The idea behind folding the dumplings is really simple: put a little filling in the middle of the dumpling and then fold it in half. Then move your thumbs along the sides, while pressing down to get the sides to stick together… You’re supposed to create pleats along the edge for extra-sealing. The hard part is getting it them to look nice, even and well-sealed. Mine always look lopsided and remind me of sad-looking dinosaurs… But once you get the hang of it, it’s actually really quick to fold them. If you do it properly, as in the video, the dumplings should look like proud dinosaurs instead. Much better! Ok, so now you should be facing a sea of uncooked dumplings, waiting to get cooked and eaten. Making dumplings for the dumpling party sure takes a while but it’s fun to do and well worth the effort! How you choose to cook them is entirely up to you… Like I mentioned before, boiling the dumplings in water (kinda like making tortellini) is the traditional way of eating dumplings during the Chinese New Year, and is often how dumplings are served in China. 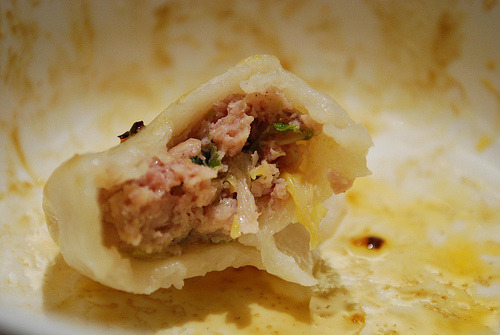 Boiled dumplings are called 水饺 shuǐjiǎo. Other ways of cooking the jiaozis include pan-frying them or steaming the dumplings. Really can’t say which cooking method I like most! Making the dipping sauce and you’re ready for your Dumpling Party! The last thing to prepare is the dumpling dipping sauce. The sauce is a traditionally a mix of Chinese black vinegar (醋 – cù) and soy sauce, to which chili, ginger, chives and garlic may be added. Start with 125 ml of vinegar (cider vinegar or wine vinegar will also work as a substitute) and 30 ml soy sauce, and then add some ginger and chili. Tinker with the sauce until you find the taste you like best! I’ve had trouble getting used to Chinese black vinegar so my sauce is real simple: just soy sauce mixed with dried chili flakes. Now, all that is left to do is eat and enjoy! And remember, making dumplings is a traditional family activity on the Chinese New Year’s eve but, as the LA Times points out making dumplings is always a great group activity to do during a dumpling party (dah), whenever you feel like it! 蛇年快乐! shéniánkuàilè! Happy Snake Year! Ninchanese is a new platform where you’ll have a blast learning Chinese! Stay in touch with us on Facebook, Twitter, Google + and Weibo.